Philips developments in mercury fluorescent lamps began in 1937 with the HPL300, employing sulphide phosphors to increase red ratio from 1 to 4%. In 1950 these were replaced by a new HPL lamp using arsenate phosphors to achieve 7.5-9% red. This was superseded in 1968 (HPL-N) using Sylvania's 1964 development of vanadate phosphors, featuring 11% red, 10% higher efficacy and a whiter colour. Efforts then focussed on reducing the colour temperature to achieve a warmer light for indoor lighting. The first step was Philips' HPL-Deluxe lamp of 1972, delivering 3300-3700K with 14-16% red. 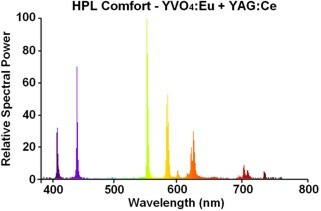 This was achieved by enlarging the phosphor particles from 1.8 to 6.8 microns, permitting a thicker coating to achieve a greater red conversion while reducing light absorption. The result is a more efficient lamp with better colour rendering. However its popularity was limited due to the fact that it had a distinctly pinkish hue. In 1983 this problem was solved in the HPL-Comfort lamps, which in effect combine the efficient HPL-Deluxe phosphors with YAG:Ce from the Sylvania Warmtone lamp, which was inefficient but did have a good warm white colour. The yellowish body colour of the latter phosphor is responsible for weakening the mercury blue lines to push the colour point back to the blacbody locus. Ordinarily this phosphor has a blue-green radiation which would be undesirable, but at the high bulb temperatures its output is shifted to orange. 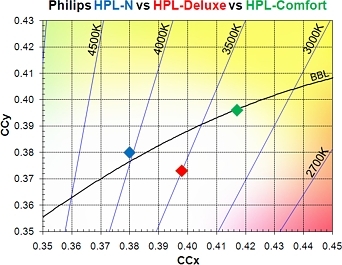 HPL-Comfort thus offers a higher efficacy than standard vanadate-coated lamps, with a lower colour temperature, higher CRI and a white light on the blackbody locus. 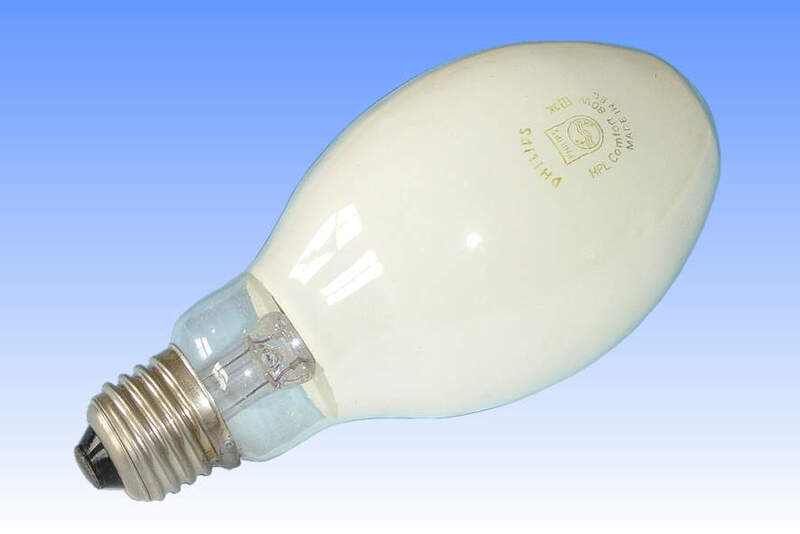 This development swiftly rendered the earlier 'deluxe' lamps obsolete, but has not displaced the ubiquitous vanadate lamps on account of the higher cost of the YAG material. References: 1) Philips Training Manual MTO Turnhoutlampen, Hogedruk-Kwiklampen, Van der Stap & Goethals, 1986, pp. 11-12 en 48. 2) Philips Booklet "High Pressure Mercury Vapour Lamps", April 1986. 3) Philips UK Lighting Catalogue, 1993/94. 4) Philips UK Price List, December 1995.